1118-1143 The imperial succession following the death of Alexius had been less smooth than hoped for. Alexius's wife Anna and her daughter Irene pulled all the stops to see to it their candidate, Nicephorus Bryennius, succeeded the dying Alexius. 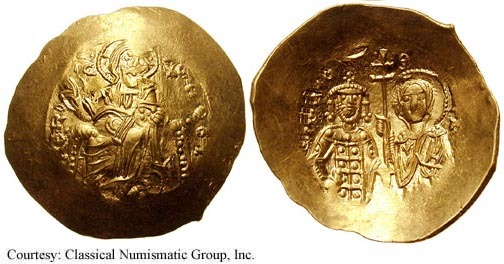 But John, Alexius oldest son and the intended successor, assumed the throne and consolidated his authority after decisively dealing with his mother and sister. John proved a remarkably able leader that would have made his father proud. He was able to regain much lost territory and settle the remaining pockets of resistance either by military or diplomatic means. His early successes finally earned him the popularity of his people that still eluded Alexius. With this he found the empire on solid enough footing to undertake the recapture of key provinces lost to the turks over the previous centuries. Unfortunately, he suffered a wound while hunting that grew into a serious and ultimately fatal infection. Disappointed in the inevitability of his death he named his son Manuel emperor and died a few days afterward. SB 1938, DOC IV 1 AU Hyperpyron Obv: Christ enthroned facing,. Rev: Half-length figures of John and the Virgin Mary facing, holding patriarchal cross between them. 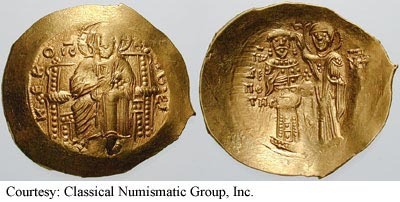 1118-1122 (Constantinople). $300 5/21/03. SB 1939, DOC IV 2 AU Hyperpyron Obv: Christ enthroned facing, holding Gospels. Rev: The Virgin standing facing, crowning John who is standing facing and holding labarum and akakia. 1122-1137 (Constantinople). $250 5/21/03. SB 1940, DOC IV 3v AU Hyperpyron Obv: Christ enthroned, holding Gospels. Rev: The Virgin crowning John. $270 9/19/01. SB 1947, DOC IV 4 AU Hyperpyron Obv: Christ enthroned. Rev: Half length figures of John and Virgin Mary, holding patriarchal cross between them. 1118-1143 (Thessalonica). SB 1948, DOC IV 6 AU Hyperpyron Obv: Christ enthroned. Rev: John standing facing, holding labarum and globus cruciger, being crowned by the Virgin Mary. c.1137 (Thessalonica). SB 1949, DOC IV 6 AU Hyperpyron Obv: Christ enthroned. Rev: John standing facing, holding globus cruciger, being crowned by the Virgin Mary. 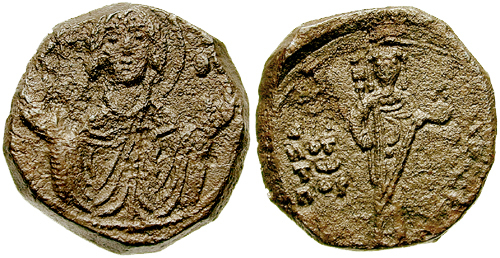 c.1137-1143 (Thessalonica). $650 5/21/03. Unlisted SB, DOC IV 4v AU Hyperpyron Obv: IC XC KERO HОёEIО”ECОёM - Christ enthroned facing. Rev: Half-length busts of John and the Virgin Mary facing, holding patriarchal cross between them. 1118-1143 (Thessalonica). $400 5/21/03. 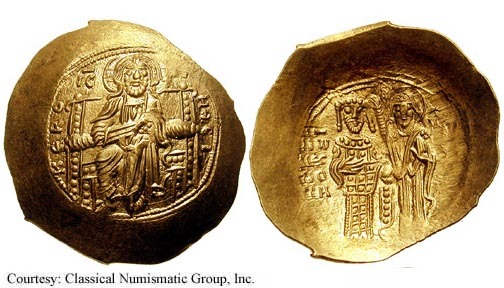 SB 1941, DOC IV 8 AU (Electrum) Trachy Obv: Christ enthroned, holding Gospels. Rev: John and St. George standing facing, supporting between them patriarchal cross on small globe. $545 5/22/02. 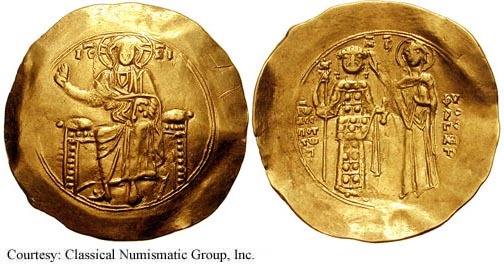 SB 1942, DOC IV 8 AU (Electrum) Trachy Obv: Christ enthroned, holding Gospels. Rev: John and St. George standing facing, supporting between them patriarchal cross on three steps. $740 5/22/02. SB 1946, DOC IV 13 AE Tetarteron Obv: Facing bust of the Virgin orans. Rev: John standing, facing; IW/DEC/POT/TW/POP at left, FV/PO/GE/NH/T at right. 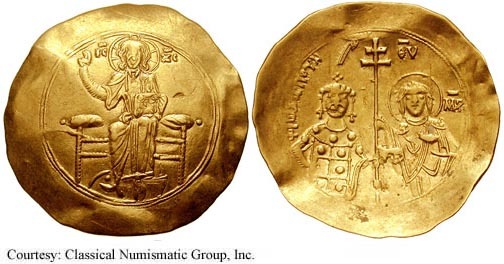 c.1118-1122 (Constantinople). SB 1954 Half Tetarteron Obv: Jesus Christ standing, facing. 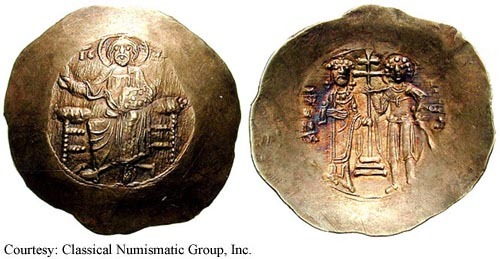 Rev: John II half-length bust facing, holding labarum and globus cruciger.